After improving all last year, house price declines have started to accelerate again, show the latest figures from the Government (Fomento). 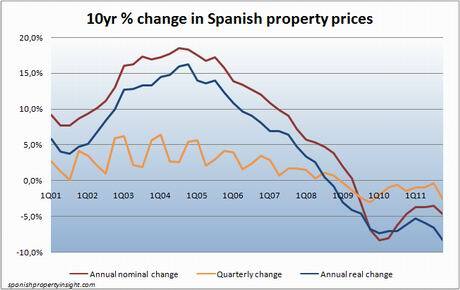 Average house prices fell to 985.5 €/m2, down by 4.7pc compared to 12 months ago. After inflation, real house prices were down 8.3pc. Prices tumbled in Madrid (-8.9pc) and Malaga, home to the Costa del Sol (-8pc). 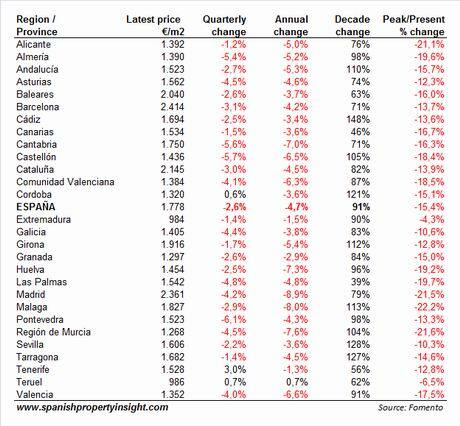 Average prices are now down 15.4pc since their peak, -22pc in Malaga, and -21pc in Alicante (Costa Blanca), but up 91pc over 10 years. 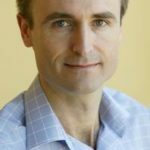 Recent interest rate rises are likely to put further downward pressure on prices.